I'm so excited for just a few weeks ago, I finally purchased an Amazon Kindle 3G! I love reading, but hate lugging around a large novel in my purse. Also, the bookshelves in our home are rapidly overflowing and I like knowing that the Kindle will help stop the physical book overload. And who am I kidding? I love tech gadgets of any kind, which definitely played into my decision to purchase a Kindle. Of course, when buying any electronic device, I always make sure that I have extra money in my budget to also purchase a top-quality protective case so that I can safely use my new gadget absolutely anywhere. CaseCrown has a slew of well-designed and fashionable cases to protect any of today's hottest electronics. 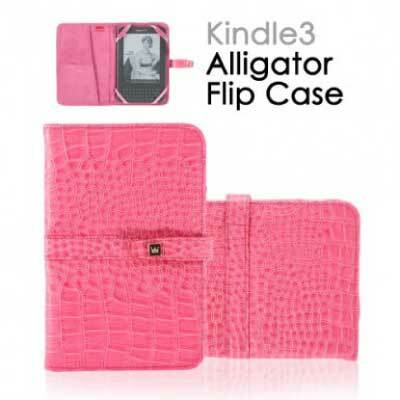 I recently had the chance to review the Amazon Kindle 3 Flip Case in Alligator Hot Pink. Keep reading to learn more! I reviewed the Amazon Kindle 3 Flip Casein Alligator Hot Pink from CaseCrown, which retails for $38.99, but is currently on sale for $30.95 with FREE SHIPPING. 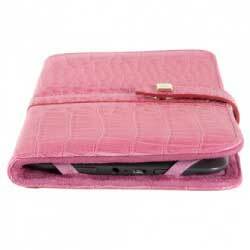 Store and protect your Amazon Kindle 3 in this CaseCrown Hot Pink Alligator Flip Case during use or while traveling! Because of its suede interior, this case will protect your Kindle 3 from scratches, fingerprints, and dust. Don't worry about the hassle of removing the case every time you use your Kindle 3 because the case guarantees protection at all times. On the inside, it has four corner straps, two of which are elastic, to hold and secure your Kindle 3 in place. There's even a single snap button closure to ensure stability. There are also interior slots available for additional storage to hold cards, paper, and accessories. Made out of synthetic leather, this case sports a unique alligator skin design so it's both practical and stylish. Once you have your Kindle 3 in this case from CaseCrown, which is designed for convenient mobility, you'll be ready to go! I was absolutely thrilled when I first received the Amazon Kindle 3 Flip Case in Alligator Hot Pink from CaseCrown, for this was one of the most stylish and chic Kindle cases I've ever seen. For me, searching for the perfect protective case is almost as thrilling as searching for the electronic device itself and I have to admit that I was instantly attracted to this Kindle 3 Flip Case for a variety of reasons. First, who can deny how fashionable and eye-catching the bubblegum pink alligator print of this case is? I love my accessories to make a statement and this one definitely fits the bill. Next, this case's slim design guarantees that I don't overfill my purse when taking my Kindle along. It slides neatly in and out of my handbag and doesn't take up much room at all. The suede interior is also a favorite of mine for I know my Kindle 3G is adequately protected against the bumps and scratches that can occur with regular use. The left-hand side of this case also contains two different sized pockets, which I use to store my USB cord and instruction booklet. Since I am still learning the ins and outs of my Kindle, I'm happy to know that my instruction booklet is neatly tucked inside the CaseCrown flip case. Finally, the one snap closure keeps my Kindle 3G neatly inside, but also easily accessible. When I find myself with a spare moment, like when waiting in line at the grocery store, doctor's office or auto mechanic's shop, I can quickly begin reading my Kindle book with just one snap of the closure. Of course, packing it away and tucking it back inside my purse is just as simple! Protecting any electronic device these days is a must for all tech gadgets are designed to be super portable. Since these items are usually quite expensive, it's great to find a company that specializes in making top-quality protective cases which are also quite affordable. If you have an iPad, netbook, eBook reader or other electronic device which is crying out for a sophisticated, well-designed protective case, then I highly recommend shopping the large selection from CaseCrown! Disclosure: I received the Amazon Kindle 3 Flip Case in Alligator Hot Pink from CaseCrown in order to facilitate my review. No other compensation was received. This product review is based on my own personal experiences with this item and is completely honest and objective.